In this post, you are going to learn proven techniques that you can immediately put to use. If you won’t check your email at least 20 (and ideally 50) times each day, you will risk that you will be able to focus on your work. And if you focus on your work, you risk completing something important. So the biggest benefit of checking email all the time is that you are in completely reactive state, working on low-important tasks, which often seem urgent but are not. That’s perfect for our purposes! Julie Morgenstern wrote a book called “Never Check E-Mail in the Morning”, but her advice is obviously counter-productive to what we are trying to achieve here. And she doesn’t know what she is talking about, anyway, because she is just the #1 USA organizer. Another expert, Michael Linenberger agrees with her in his book “Master Your Workday Now!” (which is probably the best alternative to GTD) – that’s a big disappointment, Mike! I recommend that you start at least with 2 large piles of paper, and build it to 5 or more piles over time. 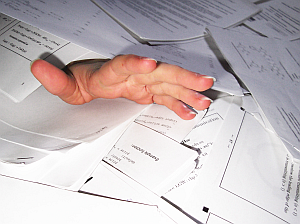 When processing paperwork, try to avoid reading it whenever possible. And ideally, some of the papers should be important or urgent. Never file paperwork to its proper place, because you would risk diminishing your anxiety and stress levels. All physiotherapists will tell you that good workplace ergonomics are paramount for your well-being. Feeling well could help us be more productive, so we shouldn’t risk it and always sit on a $20 horror-on-wheels. I urge you to always try to work on at least 2 tasks at the very same time. And if you get really good at it, you can work on 3 or even 4 things at the same time. The real masters of unproductivity can work on 5 things at once. If you are beginner at multi-tasking, then at least start checking your email in the middle of doing each task. That’s excellent news for us. By doing 2 or more things simultaneously, you will ensure that none of them gets done properly and even temporarily lower your IQ by 10 points. The saying goes: If you chase two rabbits, you will catch none. But once you setup all the above, don’t stop! You also need to set them up on your smart phone and tablet. If you start receiving a lot of notifications, then you are doing great, because you are always very well informed, but more importantly, guaranteed to greatly reduce your productivity and ability to focus. Rest assured, you will be able to forget about the risk of getting into the flow state and accomplishing anything substantial. Excellent. Researches show that when you get interrupted at work, you will return to the original task only in just over 40% of the cases, and that it takes 20 minutes on average to resume what you were doing before. This is excellent, because randomly switching tasks is one of the most powerful ways of making sure you won’t get anything done. So, I recommend that you implement open-door policy, invite others to come to you as often as possible with unimportant request and questions, and when someone sends you an email, then for Christ’s sake, JUMP OUT of the chair and run to them! Task management experts agree that good to-do list should be short and up-to-date. But we don’t want good to-do list, because good to-do lists helps us to be organized, productive, focused and not stressed, which is the opposite of what I am trying to teach you here! So, what you should do is to create as long to-do list as possible. Keep adding tasks all the time: Anything that comes to your mind. Anything that someone else suggests should be perhaps done. The less important the tasks are the better. And never delete tasks from your list! Tasks often lose importance and priority over time, so you need to keep them there to ensure that your to-do list is as outdated and irrelevant as possible. When it comes to task names, you should always make them abstract and non-actionable. No verbs. And don’t be specific. This will make sure that when you get to the task again in the future, you will have to think about what it actually is, which will help you to waste more effort and time. If you get good at this, you will add about 20 tasks to your to-do list each day (most of them useless), and complete just 2 or 3 tasks (all of them useless). That’s an excellent recipe for guaranteed stress and potentially nervous-breakdown in the long-term. So keep at it, because as you can see, the potential rewards are substantial. Also, don’t centralize your tasks and notes using a task management software such as my very own Swift To-Do List (that I’ve been working on for the last 7 years). If you place all your tasks and notes into a single place, your stress will disappear and productivity will soar. And we don’t want that, do we? It’s far better to scatter your work across dozen of documents, sticky-notes, papers, and devices. Yes, this post is a humorous one, but if you want to prevent yourself from reaching your full potential, then stick to the advice above, because the techniques above really work – and many people apply them “successfully” every day. But if you want to be more productive, eliminate stress, and become successful and significant for your company or business, then do the opposite. This article is your wake-up call. Send it to others from your workplace to wake them up as well – or they will undermine your efforts for a change. And post in the comments below – what realization you just had? What did you learn here? - By Jiri Novotny+, the obsessed author of task management software for Windows, Swift To-Do List. Jiri’s life quest is to become productivity and achievement world-class expert to empower others. His current main goal is to create the best task and notes organizer for Windows. PS: If you could use task and notes organizer for Windows, then definitely download free 30-day trial version of Swift To-Do List Jiri has been working on for over 7 years now. You will be amazed. Scrap to-do lists. Use DONE lists. I laughed out loud. Thanks for that. So it’s a good post, and you make good points, but I really don’t expect a link in a blog to automatically download an .exe file. My expectation when clicking a link to your Swift To-Do List product is that it would go to a *page* about the product, where I could then make a decision about downloading a trial version. Our blog doesn’t automatically downloads anything. There are several mentions of Swift To-Do List, which lead to the info page, and also two Download buttons, which lead to the download page. Admittedly, there was one link in the text labeled “Swift To-Do List” which lead to the download page, so I’ve corrected it now so it leads to the info page as well. Thanks for spotting that. I am sorry for any confusion. By the way, all our downloads are code-signed.